Six Until Me. : Checking Out Telcare. Over the weekend, I received a demonstration kit for the Telcare meter, marketed as the 'world's first cellular-enable blood glucose meter.' There's some information out there about Telcare already, including this review from the Wall Street Journal, and I'm happy to take a crack at this new device. 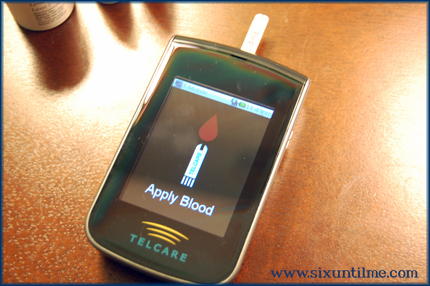 At first glance, the Telcare meter looks like an iPhone. Because everything wants to be an iPhone, doesn't it? (Except my Blackberry, which wants to be a frisbee sometimes. Come on, RIM, keeping plugging!) It's roughly the size of my Blackberry, and while the screen isn't touchscreen, it sure looks like it could be in the future. The online tracking software is decent (I have had extensive experience on the Animas Diasend software, which I really like), and offers some options for customization. You can set your own thresholds for "high" and "low," and the visual graph helps reinforce the data trends. For me, anything that gives a cumulative view of my blood glucose trends is very helpful, because sifting through all the numbers can give me an anxiety attack. Also, having the data automatically sync online is fantastic, because it makes log booking an instant and easy accomplishment. That is a huge plus for a scatterbrained PWD like myself. I also liked the messaging options on the meter. There are a series of messages you can chose to have popping up on your screen (and it's a great option to be able to avoid all of these messages, if you want), and these reminders can help adherence with both supply reorders and testing compliance. Again, having the choice to take it or leave it is a plus. In the coming days, I'll be able to truly test the battery life of this meter, and how the trends map out using the online software, in addition to checking out the iPad app. Overall, this meter has a cool look. (Or at least cooler than most glucose meters, which tend to trend more towards lumpy LEGO than streamlined.) 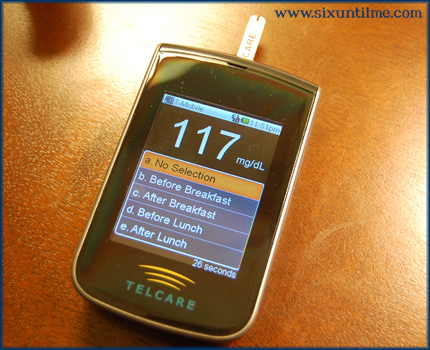 My main concern, with all glucose meters, is accuracy and precision. I really love that technology is moving along and becoming savvier, but I am very curious to see how this meter performs when it's testing actual blood. If this meter is accurate, and if the strips are covered by insurance companies (another huge need), then this little fella could be a contender. And ignore the fact that I'm commenting at 2am! I'm interested to see this meter in action too. My Diabetes Mine Design submission 2 years ago was a meter that gives the option of wirelessly sending BG readings to a caregiver, which would be useful in school, sports, or playdate situations. We use a very barebones paper logbook mostly because I haven't found a good way to download meter data in a meaningful (to me) way. Would love to see data automatically pop on on my iPhone or iPad. Thanks for sharing your initial thoughts in this new device. Hey, I like the 2 am posts! You are such an inspiration to me, Kerri. You make an effort. I have decided to do the same after a long period of not caring. 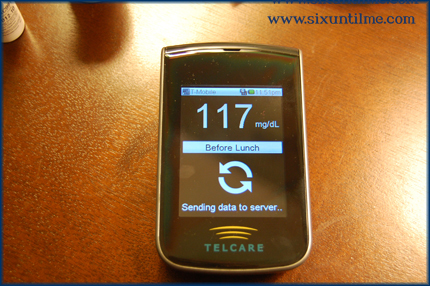 I am in the hospital right now after multiple site malfunctions that led to blood sugar levels that peaked at 883. If I hadn't been checking them I would have ended up in DKA. I have been doing this for 25 years (since age 13) and feel so close to giving up sometimes. You have helped me to care. Thank you so much for sharing your experiences, your life, and your Birdy with us so openly and generously. Thanks for the great review, Kerri! With Brandon being 15, it seems to be getting harder and harder to rely on him to take care of his D needs (without us hounding him, which we are doing now more than we've ever had to in 9 1/2 years since dx.) This kind of meter seems right up his teenage alley, especially the automatic syncing part. LOVE. That. Feature. And also, being able to 'easily' tag the reading. I could totally see us using this meter as soon as it becomes available. Again, thanks for the great review! Do you think you'll get to play with one that is ready to test blood? I would be really interested in that. Can you set alarms to remind you to test at certain key times? I wonder how hard it will be to get insurance companies to pay for the supplies. Did they indicate to you the average cost of strips or the meter? the design looks cool but it's bigger than I would want to carry. It looks interesting but I really wish the meter companies would move more towards nano technology than connectivity. From a cost benefit do wifi updates to the net really matter? Unless my pump also has wifi connectivity then it simply saves the step of plugging the meter into my pc, if I'm cool to do tat with my farming than I'm cool to do that with my meter. But if it's a step towards better Eco system integration than I'm all for it. I have not used the meter but based on your review and the one in the Wall Street Journal I don't think I'll be using this. I don't want to carry yet-another-device in my pocket. I already have an iPhone so for me the iBGStart makes more sense. 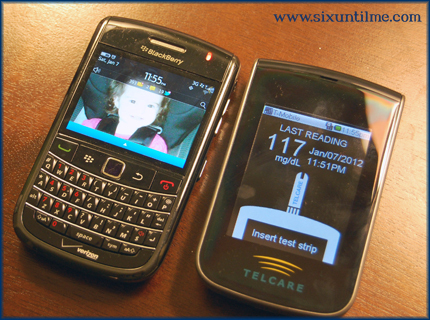 I expect we will see more medical devices that interface with our mobile phones (the iBGStar will eventually come to Android and Windows platforms).